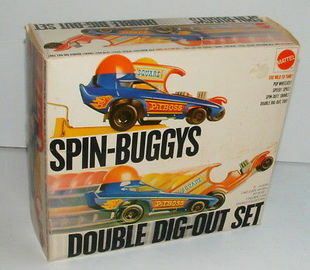 Spin Buggys were driven by a gyroscopic top toy called Wiz-z-zers by Mattel. The top was revved up and dropped into a recepticle in the roof, engaging the rear axle. There were only two vehciles, the orange T-Square C-cab van, and the blue Pit Boss dragster.